DoceboInspire comes to Toronto this October, where “The Six” will play host to the learning industry’s most influential voices to discuss and gather insights into the future of learning technology. Docebo is excited to present DoceboInspire’s amazing roster of keynote speakers. Read on for a taste of the expert insights they’ll bring to the table. If you don’t have your calendar marked for DoceboInspire 2018 already, this might be the push you need to do so ASAP. Docebo is getting closer and closer to the second edition of their annual user conference, this year in the incredible (we’re not biased at all…) city of Toronto. For three days this October, “The Six” plays host to the learning industry’s most influential voices in a user conference designed to bring together more than 500 L&D professionals to discuss and gather forward-thinking insights into the future of learning technology. Docebo has put together an unrivaled agenda and a plethora of networking opportunities, and now their excited to present their roster of heavy-hitting keynote speakers to bring it all full circle. 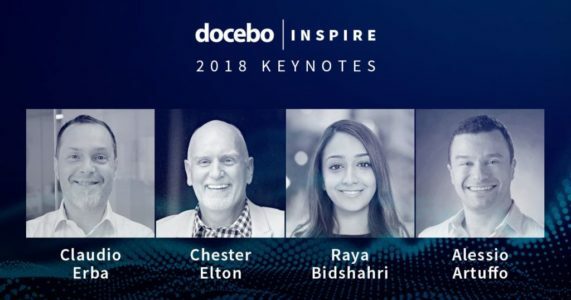 Below you’ll find a list of this year’s DoceboInspire keynote speakers and a taste of the exciting expert insights they’re bringing to the table, including employee engagement, building the best teams, technology’s impact on the future of learning and how AI will change the game forever. One of today’s most influential voices in workplace trends, Chester Elton has more than two decades of experience helping his clients engage their employees to execute on strategy, vision and values. Dubbed the “Apostle of Appreciation” by The Globe and Mail, “creative and refreshing‚” by the New York Times, and a “must read for modern managers” by CNN. He has co-authored multiple award-winning New York Times and Wall Street Journal best-selling leadership books (All In, The Carrot Principle, and The Best Team Wins), which have been translated in more than 30 languages and have sold more than 1.5 million copies worldwide. He currently serves as a leadership consultant to firms such as American Express, AT&T, Avis Budget Group and Procter & Gamble. Elton’s keynote discussion will explore the disciplines deployed by today’s most effective team leaders. His research has discovered a set of leadership disciplines that produce the best results among today’s best corporate teams. You can expect insights related Elton’s 850,000-person study of the most profitable and innovative teams, introducing attendees to the new science of teamwork, such as how to help leaders with the pace of change in business, the rise of Millennials and the need to work more cross-functionally across departments. Raya Bidshahri is the founder and Chief Executive Officer of Awecademy, an online educational platform that prepares global learners, educators and industry leaders for a world of accelerating change due to exponential technologies. This incredible 23-year-old serial entrepreneur is also the co-founder of various initiatives, including The Dubai Science Festival, Intelligent Optimism, SheWorks! and Cafe Scientifique Dubai. She regularly contributes articles to Singularity University’s Singularity Hub, where she writes about the future of education and the workforce, along with the effects of exponential technologies on society. Described as a “revolutionary entrepreneur,” Docebo’s CEO Claudio Erba regularly appears on thought leadership and “movers and shakers” lists in the learning technology industry. He lectured at the University of Florence from 2001 to 2005, before founding Docebo in Milan, Italy in 2005. He has spent the last twelve years developing Docebo into a global learning technology company that today has offices on three continents and partners worldwide, serving more than 1,400 clients in 80 countries. Erba’s can’t miss keynote presentation will outline his vision for where the e-learning industry is headed in the coming year, and how Docebo is helping to drive the industry forward with its dedication to game-changing technology that drives organizational performance. Born in Italy, Alessio Artuffo lives and works in Docebo’s Toronto, Ontario, Canada office. He spearheaded the launch of Docebo’s North America’s operations in 2013 in Athens, Georgia. In his role as Docebo’s Chief Revenue Officer, Artuffo is responsible for the company’s revenues, services and customer success teams. Prior to his current role, he led Docebo's International Sales and Channel organizations and was previously the US Country Manager at another learning technology provider. With almost two decades of experience in the learning technology space, he has supported high-performing teams at some of the largest Fortune 500 companies in the world, designing and implementing highly complex online learning solutions. His expertise includes modern growth approaches for highly performing SaaS businesses and helping European companies succeed in the North American market. DoceboInspire is designed to disrupt traditional training and development conferences by placing an emphasis on addressing the challenges and providing the insights learning professionals need to drive their organizations forward in an interactive, hands-on user conference. We’re also introducing DoceboU to the 2018 edition of our user conference, which is a half-day long enhanced training course on the Docebo platform. This optional training day will take our users on a deep dive into our platform and shows our users to take their knowledge of it to the next level with expert insights into technical functions, troubleshooting and more.